Looking to share your own style in stickers? Try Placeit Laptop Sticker Mockup. This decal mockup features a silver laptop on a wooden table next to a glass of water in an out of focus dim light bar. 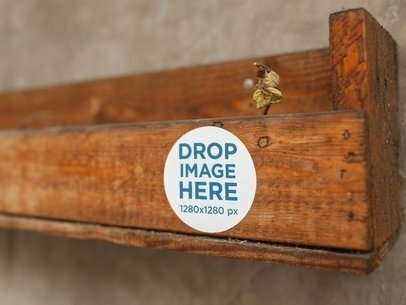 Give it a shot with this sticker mockup and amaze yourself. 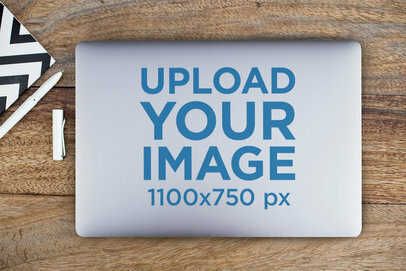 Go ahead and promote those cool stickers you've made with this decal mockup by Placeit. 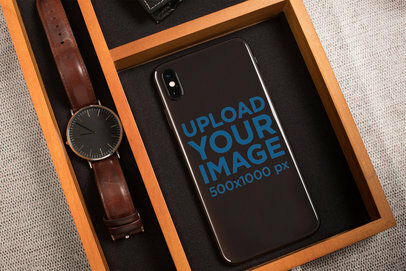 Enlight your brand with this shot featuring an elegant accessories kit and a brown leather watch that will give your phone sticker a classy look. 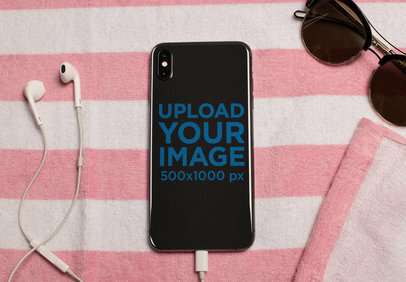 Edit your Phone Sticker Mockup now. Looking to promote those cute phone stickers you made? Try this Placeit's decal mockup and see how easy it is to show off your style. Just check out your cool stickers in no time and create attractive visuals right away! 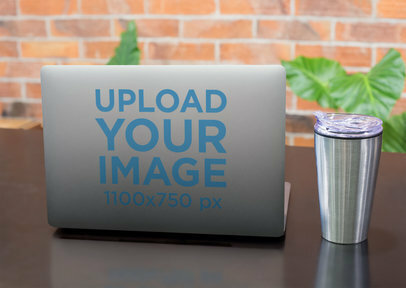 Promote your awesome sticker designs with Placeit's print mockups. It's easy, just edit the settings to your liking and you'll be ready to post in no time. Our mockups are super easy to use and don't require any additional software. Cool, right? Try it out. 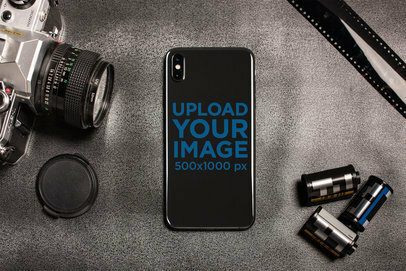 Edit your phone sticker mockup now. 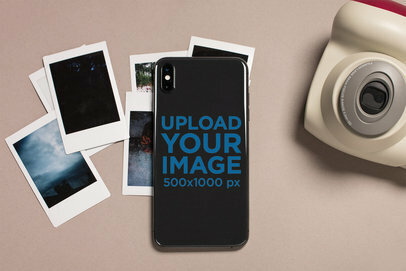 Your Phone Stickers will look amazing on Placeit's easy to use mockups. There are so many for you to choose from and you won't have to worry about downloading any additional software. Cool, right? Try it out, it's fast and easy. 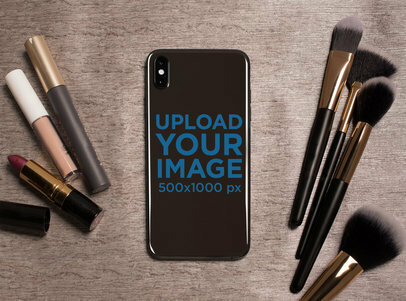 Edit your Phone Sticker mockup now. Made some cool phone stickers? Promote them with Placeit's mockups! They're super easy to use and feature the best locations, models, settings, and more. You don't even need to download any additional software, it's ready for you to use. Cool, right? Try it out now. 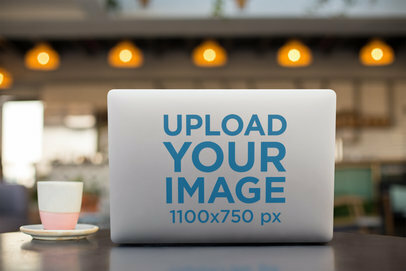 Create a gorgeous visual that will help you promote your latest designs for laptop stickers using Placeit's mockups! This amazing image by Placeit is a great choice since it shows a photorealistic version of a sticker for the back of a laptop, use it now and show your audience a gorgeous visual online of your latest sticker design. 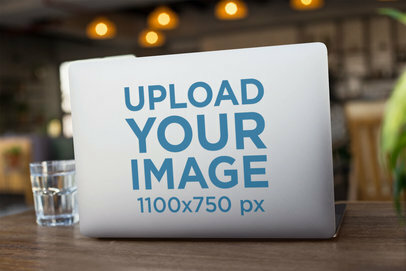 Promote your cool laptop stickers with Placeit's easy to use print mockups. Our mockups are ready for you to use and don't require any additional software. Cool, right? All you have to do is customize the settings to your style and you'll be done in no time. Try it out, edit your cool laptop sticker now. 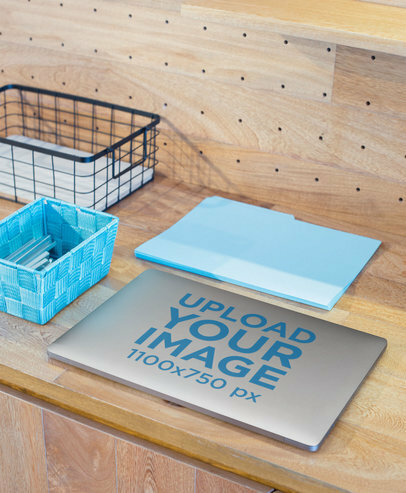 Promote your Sticker designs for laptops with Placeit's amazing print mockups. It's easy, just edit the settings to your style and you'll be ready in no time. Your design will be the first thing people see, cool, right? Try it out now. 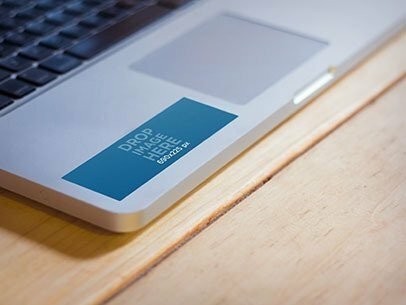 Edit your sticker mockup. 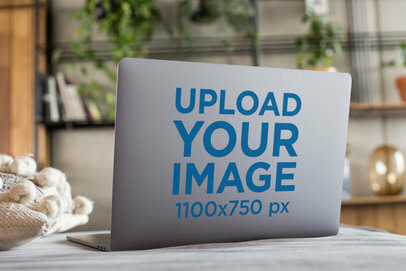 Create a beautiful visual to promote your latest sticker design using Placeit's laptop sticker mockup! This amazing image is a great choice if you want to promote a gorgeous visual using an image that will help you show your audience a more realistic version of your already cool design. 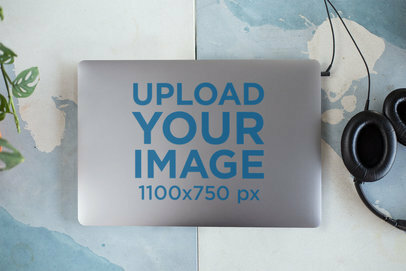 Start now showing this decal mockup and make your revenue grow with cool visuals! Did you make some cool laptop sticker designs? Use our mockups and start showing them off on an actual laptop. Placeit has a ton of cool mockups for you to choose from. Just customize the settings to your style and you'll be ready in no time. Cool, right? Try it out now. 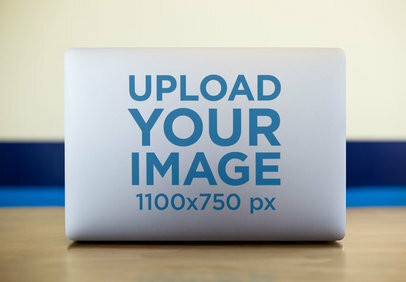 Create a beautiful visual to promote your decal designs using Placeit's laptop sticker mockups! This cool image is an excellent choice if you want to display your sticker design using a photorealistic visual that your audience can feel identified with. 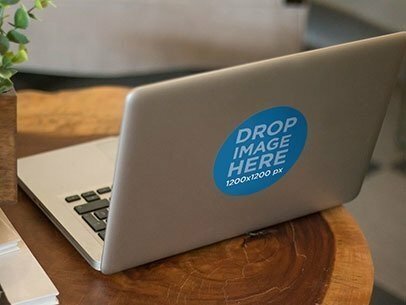 Start now, make your revenue grow by showing a beautiful laptop sticker image from Placeit! 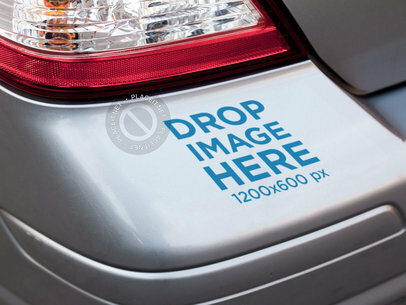 Create a beautiful visual to promote your latest sticker design using Placeit's sticker mockup! This awesome tool is a great choice if you were looking for a better way to promote your stickers online using a gorgeous image to match them with. This decal mockup is also a great choice if you are looking to improve your branding strategy! 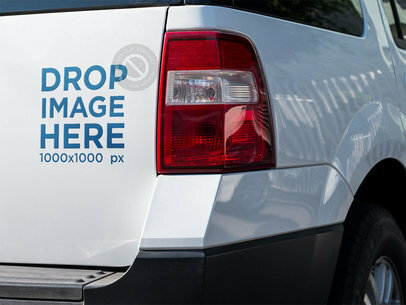 Check out this mockup featuring a square sticker on the back of a white truck, it's a really cool visual that you can use to promote your logo in a creative way. Start using it right now! Just drag n' drop your image file on the interface, we will merge it for you in just seconds. How great is this? Try another Sticker Mockup here! 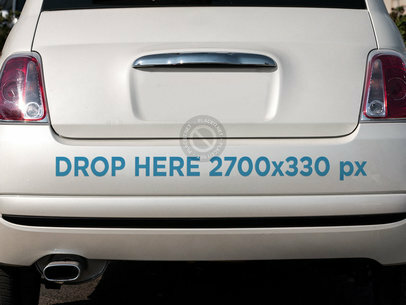 Take a look at this awesome mockup featuring a sticker on a car's back bumper, it's a really cool option for you if you are looking to showcase your latest design in a simple and beautiful way. All you have to do is drag n' drop a jpeg or png image file of your design over the interface. Easy, right? Start using Placeit now and make your revenue grow! Try another Sticker Mockup here! 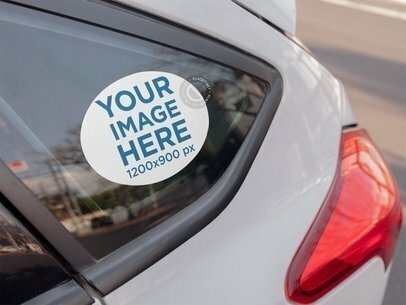 Check out this awesome mockup featuring a sticker on the back bumper of a car, it's a really cool visual that you can use to promote your latest logo in a cool way. Start now, just drag and drop a jpeg or png image file over the interface, we will merge it for you in just seconds. Use Placeit now and make your revenue grow! Try another Sticker Mockup here! 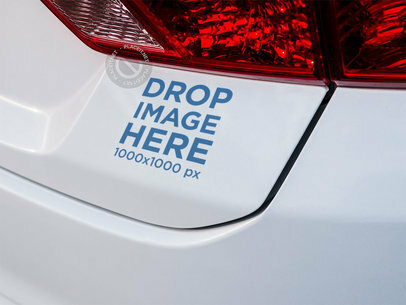 Check out this awesome mockup featuring a square sticker on the back bumper of a car, it's a really cool visual that you can use to promote your latest logo in a creative and professional way! All you have to do is drag-and-drop your png or jpeg over the interface, that's all! After a couple of seconds you will see the processed image on your screen. Try another Sticker Mockup here! 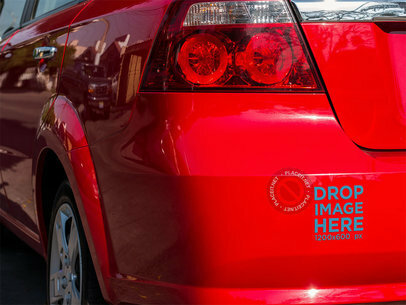 Take a look at this mockup featuring a square sticker in the back of a red car's bumper, it's a really cool visual that will help you promote your latest logo in a beautiful and creative way. It's really easy to use! All you have to do is drag-and-drop a jpeg or png image file over the interface, we will merge it for you in just seconds. Start using Placeit to market your business in a smarter way. Try another Sticker Mockup here! 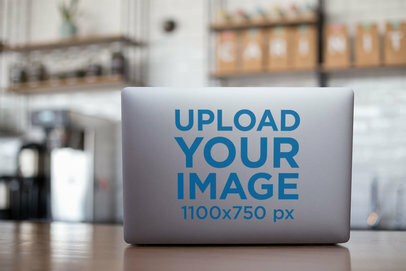 Start showcasing your awesome sticker designs now with Placeit's gorgeous mockups! All you have to do is drag-and-drop a jpeg or png file on the interface, it'll be automatically processed. After a few seconds you'll see your result image with your sticker design on it. 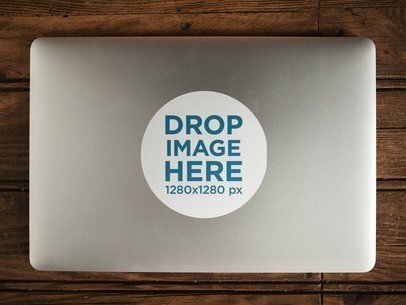 This template features a sticker on the back of an opened macbook, it's perfect to display your latest design or logo! Try another Sticker Mockup here! Display your designs or logos with Placeit's awesome visual assets! All you have to do is drag-and-drop your image design on the interface, we will merge it for you in just seconds. Start now! It's easy, isn't it? A beautiful and professional image after just a few seconds of waiting, that's Placeit. 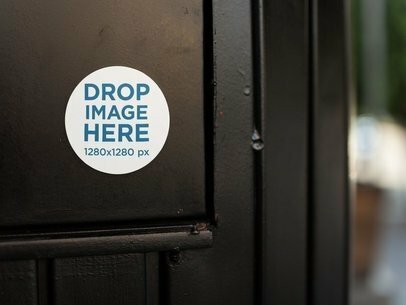 This mockup features a round sticker on a black door, waiting for you to put your design on it. Try another Sticker Mockup here! Engage your audience with photorealistic mockups. 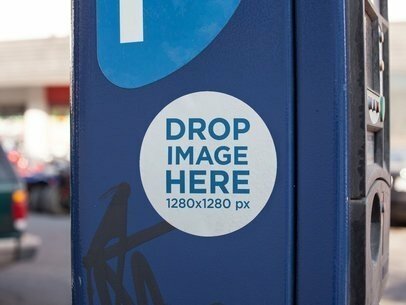 This mockup features a round printed sticker on a blue parking meter on the streets, this eye-catching visual asset will draw attention to your promotional designs and brand. Is super easy! All you have to do is drag-and-drop your design inside the mockup and we will do the rest for you. Try another Sticker Mockup here! 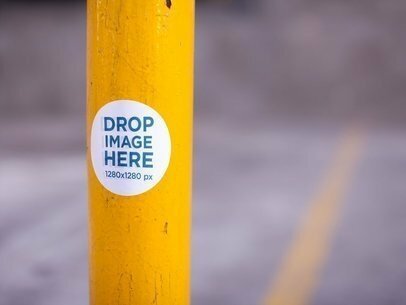 Showcase an awesome urban or car-related design or logo with this cool mockup of a round sticker on a yellow pole in a parking lot. It's a really cool option to display your design in a creative and professional way. Remember that high-quality images play a major role in how your design is perceived by your audience. Just drag-and-drop your jpeg or png file on the interface, we will merge it for you in just seconds. Try another Sticker Mockup here! Check out this awesome mockup of a sticker on a closed macbook over a wooden surface. It's a great choice for you to put your design on. All you have to do is drag-and-drop your image file on the interface, we will process it for you in just seconds. Start now! This mockup will improve your image marketing and make your revenue grow! Try another Sticker Mockup here! Start showcasing your most amazing designs with this mockup from Placeit! 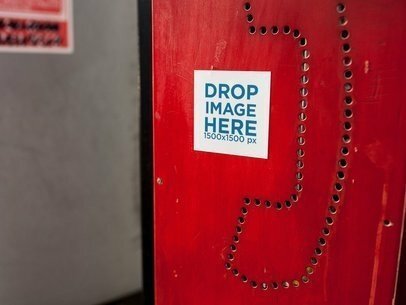 It features a square sticker glued to a red phone booth, it's awesome! 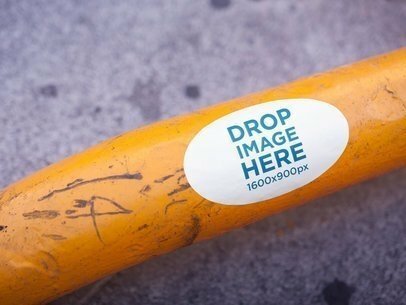 All you need to promote your communications or urban design or logo with this sticker is to drag-and-drop your jpeg or png file on the interface. It'll be automatically merged! Make your revenue grow now with Placeit. Try another Sticker Mockup here! Have a look at this gorgeous mockup of an oval sticker on the quarter glass, it's a great option for you to showcase your awesome design! This visual asset is an option for you to display an urban or car-related design or logo, start now! All you have to do is drag n' drop your image file on the interface, it'll be processed in just seconds. Try another Sticker Mockup here! Check out this beautiful sticker template from Placeit! 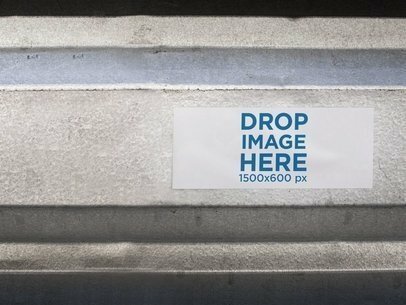 It's a rectangular sticker on a metal fence, use it to showcase your latest designs! All you have to do is drag-and-drop your image mockup on the interface, we will merge it for you in just seconds. Start now! Make your revenue grow with Placeit. Try another Sticker Mockup here! Use this incredible mockup by Placeit and make more money with your designs! 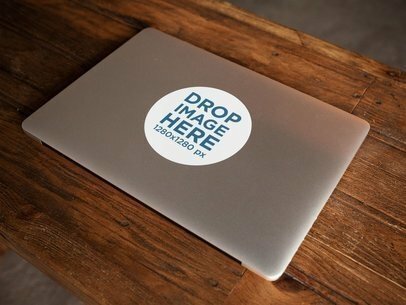 Branding has never been so cool, this mockup features a sticker on top of a MacBook, it's a beautiful visual asset that will make your revenue grow day by day. Start now! All you have to do is drag-and-drop your image design on the interface so it can be automatically processed. See more Sticker Mockups by clicking here! Showcase your latest design using Placeit's beautiful visual assets! All you have to do is drag-and-drop your image design on the interface, start now! This mockup features an oval sticker on a yellow parking spot tube, it's great to showcase a car-related or urban design or logo. Make your revenue grow with Placeit! Try another Sticker Mockup here! Showcase your awesome designs with Placeit's visual assets. All you have to do is drag-and-drop your image design on the interface, it'll be automatically processed. After a few seconds you'll see your design merged with this awesome round sticker glued to a wooden shelf. It's a really beautiful choice if you are looking for a creative way to promote your brand or designs. Start now and make your income grow! Try another Sticker Mockup here! Start promoting your brand with Placeit's visual assets! 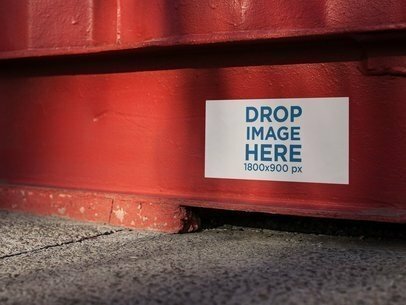 This mockup features a sticker glued to the lower part of a red container, lying on a concrete floor. All you have to do to merge your design with it is drag-and-drop your jpeg or png file on the interface, we will process it for you in just seconds! That's amazing, right? Start now and make your income grow! Try another Sticker Mockup here! Forget about old stock photos of your stickers, and also about just putting your design on your site and on social media. Start using Placeit and see how everything changes! Using beautiful images with photorealistic environments will help you give a more professional impression, making people appreciate more your designs. 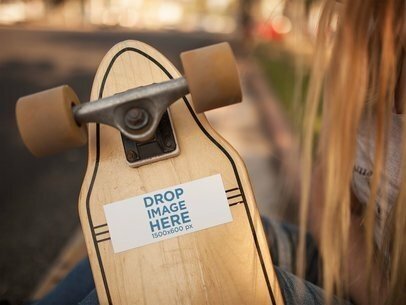 Use this mockup of a long haired girl holding a longboard with a sticker glued to it while outdoors and make your revenue grow! Try another Sticker Mockup here! Showcase your most awesome designs with Placeit! 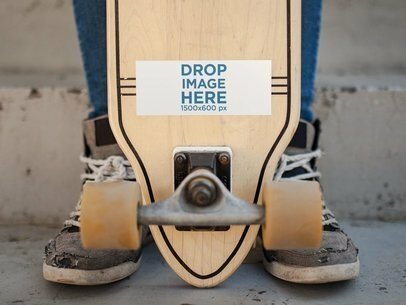 This mockup features a horizontal sticker glued to a longboard, held by a man. It's a great option if you are looking to promote urban designs. Start now! Just drag-and-drop your image file on the interface, we'll process it for you in just seconds. Beautiful visual assets help your customers build a better connection with your brand. Make your revenue grow, start now! Try another Sticker Mockup here! Use this stationery mockup to help you promote your business in a creative, fresh way and appeal to your consumers right away. This branding mockup features a sticker plastered to a Macbook Pro. Imagine how this mockup would look with your business logo or latest design being featured on the sticker? To do this all you need to do is choose an image, drag and drop it onto the template or input a URL and Placeit will help you resize it and adjust it for you. Never before had creating incredible visual content been this easy! See more Sticker Mockups by clicking here! Improve your visual marketing campaign with the help of marketing tools from Placeit and draw your consumers attention to your ideas right away. 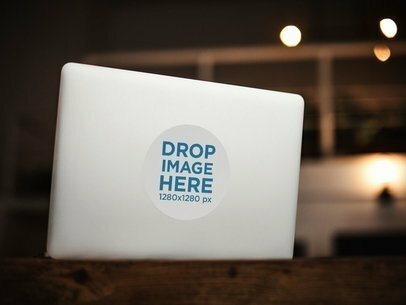 This branding mockup features a decal laptop sticker pasted to a Macbook Pro. Use this great branding mockup to help you boost your marketing strategy and finally get your ideas the attention they deserve. In order to start using this great mockup all you need to do is drag and drop an image of your choice onto the sticker on the template so Placeit can resize it for you. What are you waiting for? Start using mockups to generate outstanding visual content to add to your visual campaign now! See more Sticker Mockups by clicking here!